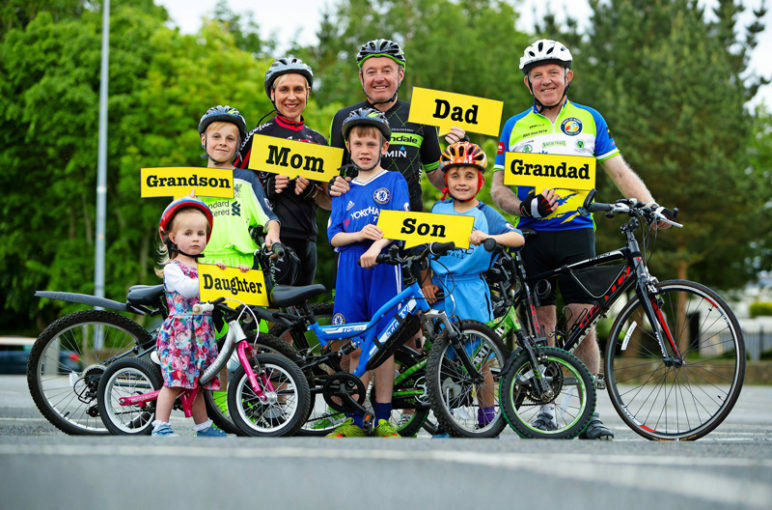 With the recent fatalities on Kerry’s roads and calls for a Minimum passing distance law it is great to see local newspaper Kerry’s Eye has launched a massive safety campaign aimed at keeping cyclists safe on the county’s roads. 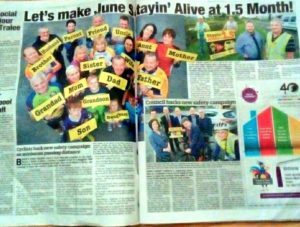 The newspaper has announced June as Stayin’ Alive at 1.5 Month in Kerry – with the full support of Kerry County Council, the Ring of Kerry Charity Cycle, local cycling clubs as well as the founder of the national Stayin’ Alive at 1.5 campaign, Phil Skelton. Stayin’ Alive at 1.5 is a safety campaign highlighting the need for drivers to observe a safe minimum passing distance of 1.5 metres when overtaking cyclists, and aims for this minimum passing distance to be written into law. 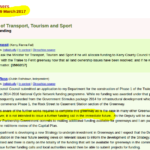 To ask the Minister for Transport, Tourism and Sport if he will allocate funding to Kerry County Council to allow it to proceed with the Tralee to Fenit greenway now that all land ownership issues have been resolved; and if he will make a statement on the matter. …it is not intended to issue a further funding call in the immediate future. 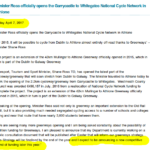 A week later Minister Ross was in Athlone to open an extension to the Dublin Galway Greenway where he indicated that new Greenway funding would be announced this year. I expect to be announcing a new competitive round of funding later this year. We are not too sure if things change that much in a week but it seems that a new funding round for Greenways may come on stream later this year, this can only be good news for the Tralee to Fenit Greenway and similar projects around the country. John Brassil has indicated that he has sought clarification from Minister Ross. Minister Ross has responded to the additional PQ raised by John Brassil in order to clarify the funding timeline. Unfortunately it seems that additional Greenway funding may not be available in the near term. 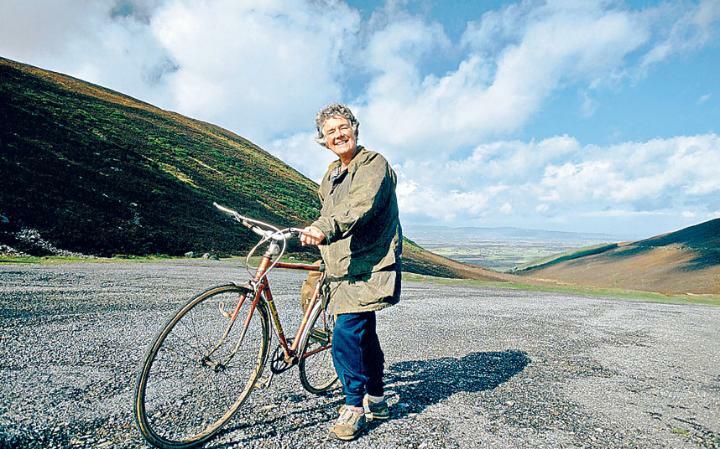 This has implications not only for the Tralee-Fenit Greenway project but also for the South Kerry Greenway and the Kerry section of the Great Southern Trail. That said it is good to hear that the department is committed to funding these project over the remaining years of the current capital plan. There will be no new funding calls for greenways until the review of the Capital Plan is complete and there is clarity on the funding that will be available for greenways for the remaining years of the capital plan. As a fan of Jack Thurston’s Lost Lanes, alas one who has yet to cycle any of the routes, I wished someone would write a similar book with routes closer to home. 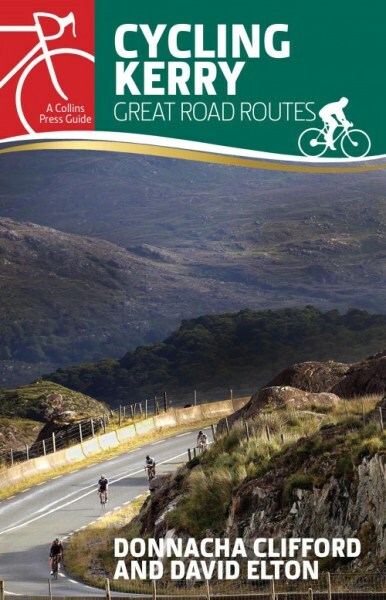 So I was delighted when I learned that David Elton, Donnacha Clifford of the Kerry Cycling blog had written a book on Great Road Routes in the kingdom. With some of Ireland’s most beautiful and untamed scenery, 400km of rugged coastline and enticingly peaceful roads, what better way to explore County Kerry than by bike? Enthusiastic cyclists Donnacha Clifford and David Elton have joined forces to write the first guide to the best cycling routes the Kingdom has to offer. Each route description is illustrated with colour maps, photos, a gradient graph and key facts and statistics. Information is provided on the natural landmarks and historical sites you’ll see along the way. With over 2,500km of road covered, the graded routes suit all abilities. In a county famous for its climbs, some of the country’s most spectacular ascents, summit views and descents feature, including the Conor Pass and Ballaghbeama. Take a trip through majestic mountains and along wild seashores: a cycle in Kerry will take your breath away in every sense. Or head along to the official launch which takes place on Friday 7 April at 6pm at O’Mahony’s Bookshop, Tralee, Tom Daly, cyclist, educator and author of The Rás, will be the guest speaker. There has been a lot of media attention recently regarding the proposed bill by Fine Gael Galway East TD, Ciaran Cannon and Government Chief Whip Regina Doherty which would see motorists forced to obey a minimum passing distance of 1.5 metres- and one metre in zones with speed limits of under 50 km per hour- when overtaking cyclists. 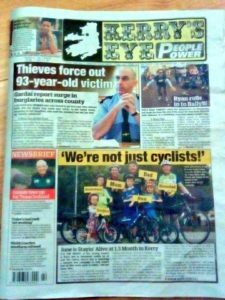 Radio Kerry invited the Kerry Cycling Campaign on to their Kerry Today show to give the view of cyclists to the proposed bill. Kerry County Council have publish a newsletter on the South Kerry Greenway. 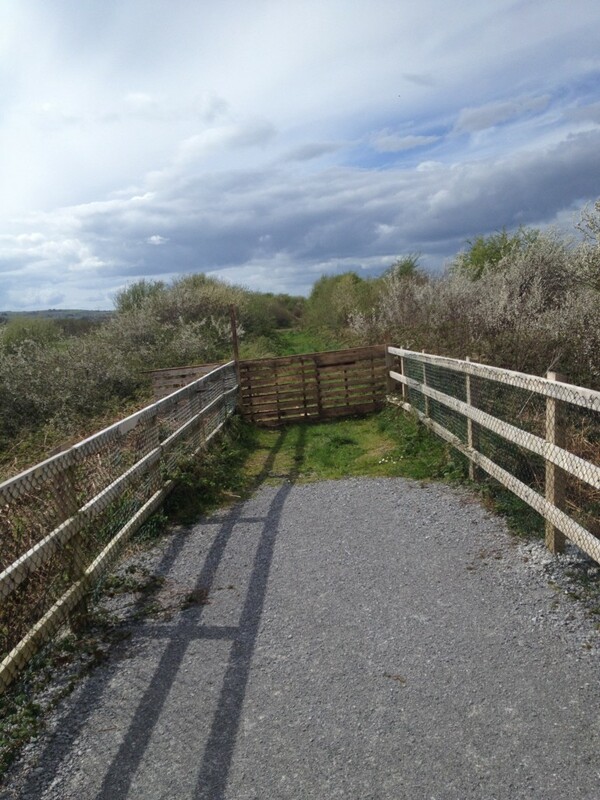 The purpose of this newsletter is to update the public and in particular the people of Reenard, Cahersiveen, Kells, Glenbeigh and the surrounding areas of the progress to date on the proposed 32km greenway from Reenard to Glenbeigh. The newsletter outlines the plans for 2016 and summarises the procedures involved in delivering the project. Part 8 planning application for the development of Blennerville to Denny Street Amenity Trail was approved at a Kerry County Council meeting on Monday, this is the first development as part of Tralee Active Travel Town project. The planning was for a amenity trail consisting of a cycle and footpath from Blennerville to Denny Street, this will be the first section of a cycle route which will ultimately stretch from Blennerville to ITralee North Campus/ Kerry Technology park. This path will also join the existing Lee Valley path which runs from the Aquadome to Ballymullen with a proposed extension to Ballyseedy woods. As well as the creation of a 6km cycle route between Blennerville and ITralee North Campus the funding will also be used to create two-way cycle facilities along Denny Street, implement ‘shared space’ zones in the Mall, introduce a 30km/h speed limit in the town center as well as the appointment of a cycling and walking coordinator to champion the smarter travel initiatives. In April 2014 the Department of Transport, Tourism and Sport (DTT&S) granted €1.3million funding for Tralee as part of it’s Smarter Travel initiative with another €900,000 funding coming from the local authority itself to develop Tralee as an Active Travel Town. The Active Travel Towns Programme is designed to achieve modal shift from the car to either walking and/or cycling and to encourage greater public transport use through facilitating greater walking and cycling access to public transport. 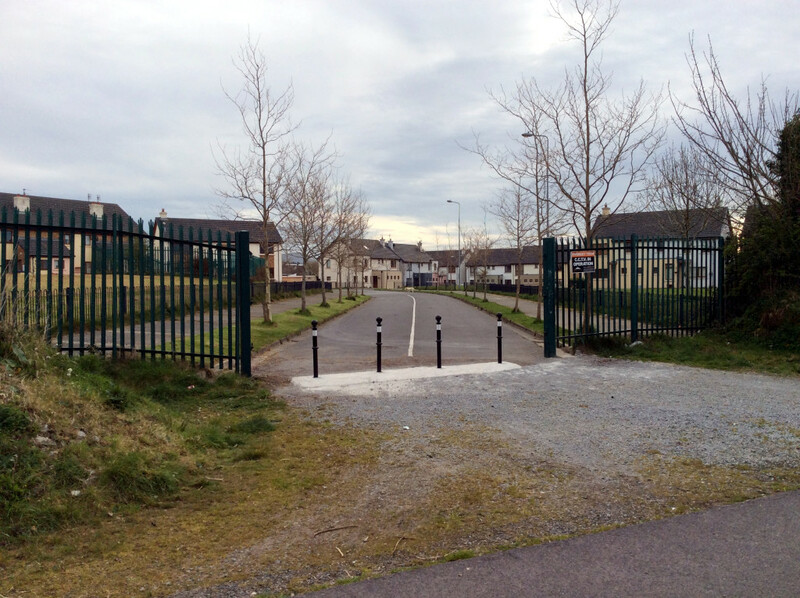 One of the main complaints of the first phase of the Tralee to Fenit Greenway was the lack of route permeation and linkage with estates it passes, with only one intermediate access point along the whole route, this issue was observed by numerous individuals and groups as part of the planning process. A prime example of this was at Gort Na Greine where the existing access point was blocked up with industrial palisade fencing despite the fact that at the time of the development this was a well trodden route. Within a short period of the fencing being installed a few sections were removed and people were able to ‘unofficially’ use the link again , it was a common sight to see people lifting bikes and even children in pushchairs through the gap in the fence. The ultimate irony here was the fact that the Gort Na Greine road had an existing cyclepath, the white line can be seen runnign down the center of the footpath in the picture above. It was great to hear that this very issue was raised by Cllr. 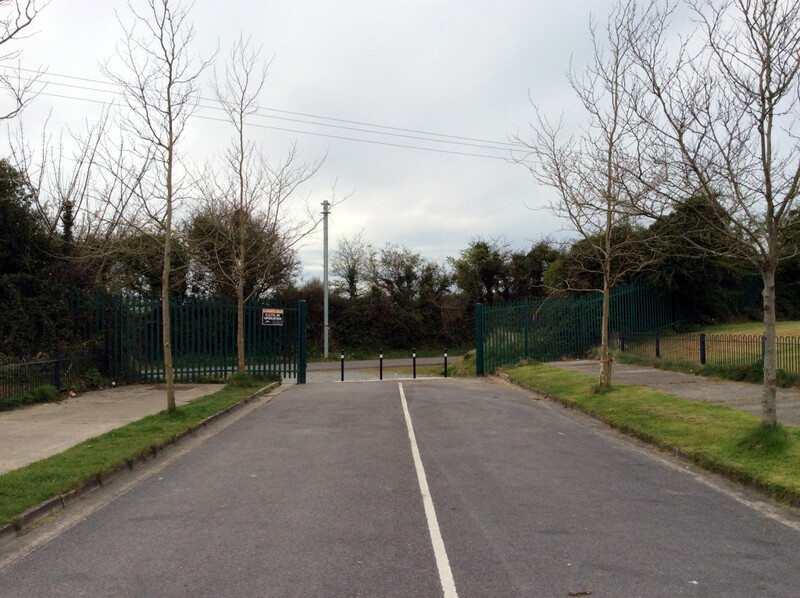 Pa Daly at the November Tralee Municipal District meeting, and that the fencing will be removed and access restored. That this Council will construct an official gateway on to the Fenit Walkway from Gort Na Greine. 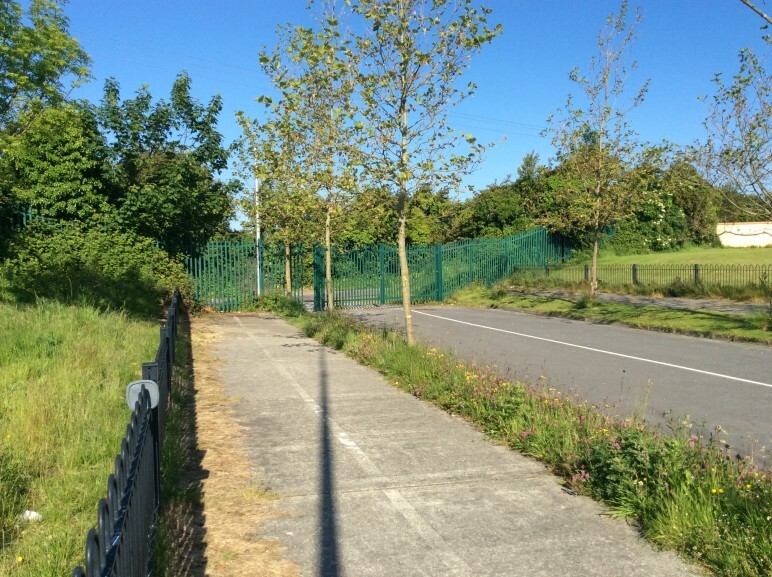 Kerry County Council have finally removed the fencing to allow ‘official’ access onto the greenway from Gort Na Greine and adjoining estates, this is great for linkages along the greenway. It is surprising that the full fencing was not removed only the part bounding the roadway meaning that pedestrians have to depart the footpath and travel along the roadway, a situation not ideal especially for the elderly, people with pushchairs, and wheelchair users.